Jon told me that some people at E3 were mentioning how they preferred the original monochrome graphics over the new grayscale + bits of color graphics. I hate to have to argue my reasons as to why we chose to go grayscale, but trust us, it's for the better, and it's not simply us trying to go more "next gen" for marketing reasons. I analyzed all the reviews we got on the first one. I listen to people's complaints, but not their suggestions generally, because complaints tell me what's wrong with it, but suggestions, unless coming from someone who knows what they're doing (someone who has designed games before), usually end up contradicting what WE want for the gameplay, or are a classic case of "good idea, doesn't work in reality". They are appreciated though, but mainly this helps us find out where we need to improve, rather than exactly how to improve it. One complaint, was people saying how they "fell through the ground on level 9 even though it was lit up". That was a shrinky orb there, and yes it wasn't communicated in the best way possible, yet was the best we could within the first game's engine. In the new one, the light halos and the fog help out TREMENDOUSLY in seeing what's going on with the light. You can see the light's radius shrinking as you approach it, rather than the ground all the sudden disappearing from beneath your feet. We're gonna do a little more to distinguish shrinkies from normals too, but this is a good step in the right direction, made possible through the new graphics. Secondly, the graphics in the old one hurt your eyes after extended play. People complained about this too. Anyway, I do have "classic mode" as a hidden option in the game for those that enjoy the monochromatic graphics, but the game isn't designed for it, so there's no guarantee that you'll enjoy it. Spotlights are quite the pain to aim when you can't see the beam. Just trust us though, we know what we're doing. I think. I woke up this morning an hour earlier than yesterday to take off an hour before the show started. It started at 10am (Western) as opposed to arriving at 11am and starting 12 noon yesterday. I arrived right at 10 this morning when everyone started pouring in so it was a rush trying to break through the entering crowd and walk faster than everyone else to get to my booth area and setup. I eventually made it and hastily set up all the business cards and set my mind straight to play Closure for hours at a time. Today seemed much different from yesterday. I guess it's because I had some experience from the day before. Many more people were willing to try the game out and get their hands on it as I explained how to play. Whereas yesterday, most people preferred to watch me play through the levels. I did that today, but not nearly as much as I did yesterday. Maybe it's because I had 2 more hours to demo today? Whatever it was, it was a slight difference from yesterday's show. Today, a couple visitors from yesterday showed up and followed up with a few more questions for clarification of the design and concept behind it. I also noticed a lot more people who had already played the game online or knew about it before today. Some people started explaining the entire game to their friends beside them because they had already played through the whole thing online somewhere. It's very satisfying to see that other game developers or people in the industry take a look at a game and say 'I've actually played this already' when asking if they want to try it out. Replying to that is a little difficult at times because there's not much to say other than asking if they enjoyed it. Another difference from yesterday, was that I had 2 chairs today, as opposed to 1 for myself. I was able to have many more one-on-one conversations with people who would sit down so I could demo or let them try Closure out, whilst still being at the same eye level. This created the oppurtunity to have good long talks, especially with some businessmen about the marketing and distribution of the new version of Closure. Now, we're still looking at options, so it's hard to say where we're going to go with it, but if we do our homework, it shouldn't be too difficult to decide by the time we're nearing the end of the development of the game. About halfway through the show today, John, aka jmtb02 (www.jmtb02.com), and Dan McNeely of ArmorGames.com showed up to pay a visit. It was great to finally see them in person after knowing of them for almost 5 years over the internet. 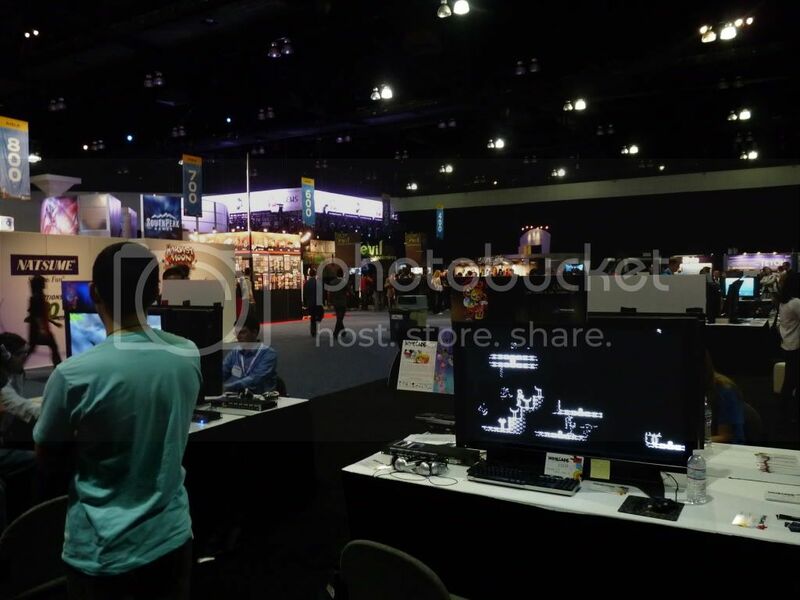 John took a lot of pictures at E3, some of which were of me. At the computer. Playing Closure - and showing it off and explaining it to a few people passing by. I also took a couple of pictures of the setup as seen below. Last but not least, I did end up bringing my laptop. I don't know if it was worth it because I couldn't keep it on due to lack of power outlets in the power strip. I did have it on for one slew of visitors to the booth though, one group being Armor Games. I used my laptop to show a little of the new Closure's mechanics such as spotlights, buttons, and physics-based balls. So all in all, after talking to people from SCEA PlayStation Network (PSN), Zeevex, and GameStreamer.net about our undecided plans for marketing and distribution, it was a fun day to get to know more people who might be able to help us out in the future when we're looking to release. There are many options out there but we have time to choose what we think is the best. The game is continuing to be well-received amongst fellow game developers so it is a good sign. As far as fun goes, I had about an hour or two to walk around and get something to eat. I discovered the entire other wing of the building where I found some more big name booths: Capcom, PlayStation, Nintendo, etc. I still haven't tested any games besides Final Fantasy Dissidia, but watching is okay with me considering I'm not an extreme gamer of most of the games such as Halo or Left4Dead. I walked around, saw what I could, took pictures of what I could, and tried to get on TV again when I could - (through G4's broadcasting in the E3 News booth with Attack of the Show and X-Play cast members as our dear hosts). 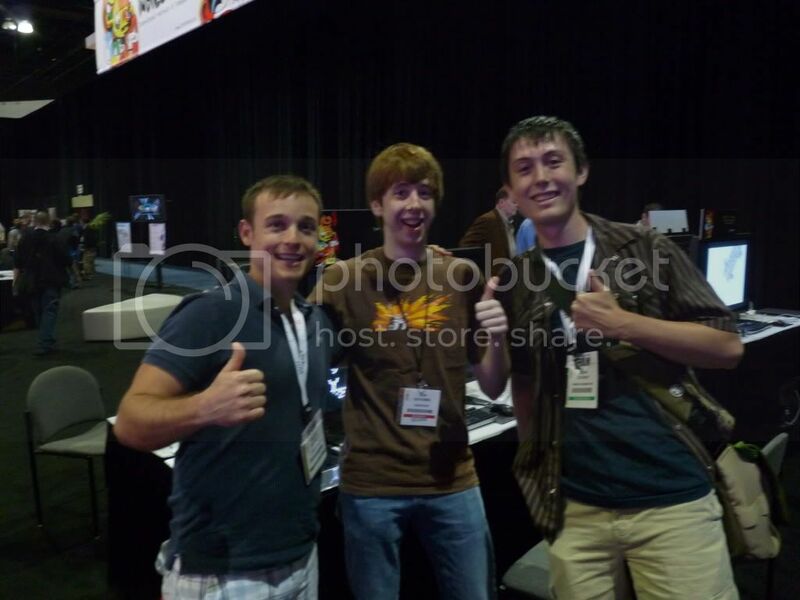 It's definitely a blast being at E3 with all the happy and cool people around to meet and introduce myself to. Tomorrow is the last day, so let's hope for the best! 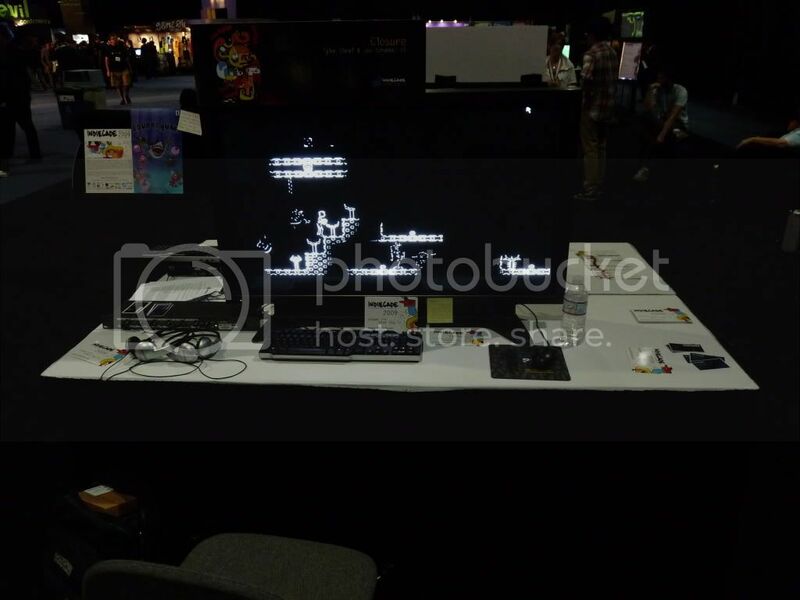 A couple pictures of the station I was set up at in IndieCade's booth. In the distance you can see the E3 news booth (with all the girders and stage lights) where G4 hosted the show live.